Great movies featuring musicians and performance: this top 10 looks at the various ways music writers, players and performers have been depicted in cinema, highlighting some of the best. Music has formed the centrepiece of some of cinema’s greatest drama. Take for example its place as a backdrop to a haunting tale of survival (The Pianist) or its use as a metaphor to depict the human condition, our relationships with each other, and ambitious pursuit (Whiplash, A Late Quartet). It can also perfectly frame the social and cultural zeitgeist (Almost Famous, 24 Hour Party People, Control), offer the structural wiring to a good biopic (Ray, Walk The Line, Frank, Crazy Heart), or provide a promotional tool (A Hard Day’s Night, Spice World). Maybe, it can simply be the pastime of a group of out of work coal miners trying to find a glimmer of hope as life’s troubles mount. In this top 10 I look at musicians – real or imagined players and performers rather than singers – and highlight my favourites. 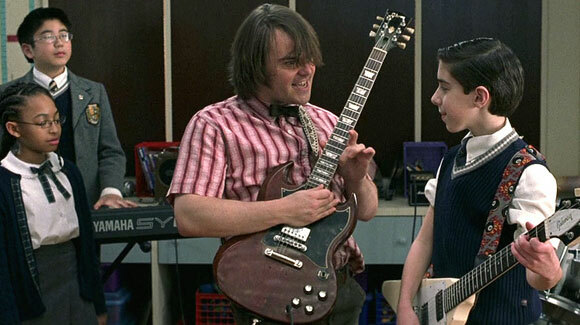 Richard Linklater’s crowd-pleasing love letter to classic rock n roll – notably the work of The Who, Led Zeppelin, AC-DC and other “loves” of protagonist Dewey Finn – School of Rock uses music to frame a coming of age tale across the generations. Firstly, there’s Jack Black’s likable failed guitarist who needs to dump his laziness and get his life in gear; secondly, there are the kids of a prestigious prep school who need to dilute their parentally induced robotic approach to scholastic endeavours and find their individuality. There’s an element of fish-out-of-water comedy about the story which makes it a joy to return to, largely thanks to a character well-suited to the talents of Black. Despite lightweight foundations and the need to turn your sense of disbelief a few notches above normal, School of Rock is a delightful confection. 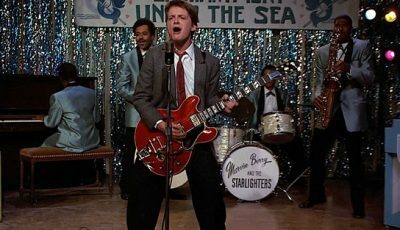 Best moment is when Zack-Attack Mooneyham (Joey Gaydos Jr.), an uptight kid under the thumb of an old-fashioned father unwilling to let rock n roll into the house, reveals a song he’s secretly written; a song that becomes the band’s competition showstopper. A wonderful ensemble including Philip Seymour Hoffman, Christopher Walken and Catherine Keaner form The Fugue, a New York string quartet which, for 25 years, has performed a variety of recognisable classical music pieces from Beethoven to Bach. Yaron Zilberman’s film uses music as metaphor to intimately portray the lives and relationships amongst the group and their nearest and dearest. The drama is given an injection of melancholy with the revelation that Walken’s cellist cannot play anymore due to the onset of Parkinson’s disease. It destabilises the group, forcing them to reassess their lives and the future of their musical careers. Written by Eugene Levy and Christopher Guest, A Mighty Wind uses the mockumentary aesthetic to parody the folk music revival of the 1960s. Guest reunites with fellow This Is Spinal Tap stars Michael McKean and Harry Shearer to form the fictional band “The Folksmen” who become part of the bill for a memorial concert. They take a backseat to the stars of the show – Mitch and Mickey (Eugene Levy and Catherine O’Hara) – who reform after years apart to the joy of their many fans. 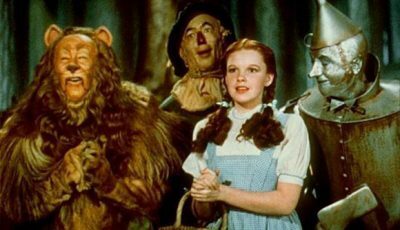 The stand out moment is their rendition of original song “A Kiss at the End of the Rainbow”, written by McKean and wife Annette O’Toole, which was nominated for Best Original Song at the Academy Awards. Anyone who saw a live performance from Ian Curtis and Joy Division in the 1980s would find the experience difficult to forget. 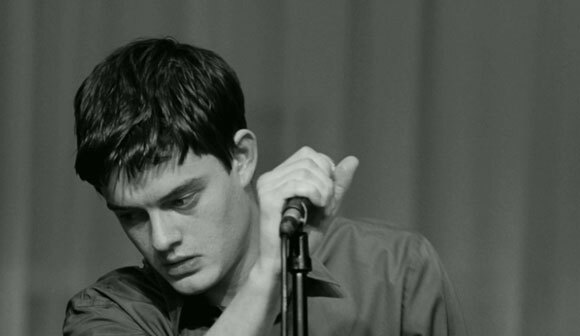 In Anton Corbijn’s dark drama, the bleak black and white photography framing the urban mundanity its principle characters seek to free themselves of, Curtis’ baritone vocals and staccato swagger are recreated with a nightmarish intensity courtesy of Sam Riley’s performance. The stand out moment is Corbijn’s overlay of Joy Division’s most famous song “Love Will Tear Us Apart” with a scene featuring Curtis telling his wife that it is okay to sleep with other men, culminating in her searching his belongings to reveal who he’s been unfaithful with. A unique drama set in Dublin, Ireland, John Carney’s drama sees real-life musicians Glen Hansard and Markéta Irglová play a pair of thirty-something’s trying to navigate their way through modern life on a shoestring budget. He plays guitar, busking on the street to earn a little extra money; she sells flowers and can play piano. The couple head to a music store where he starts playing one of his original songs on acoustic guitar while she instinctively plays along on piano. 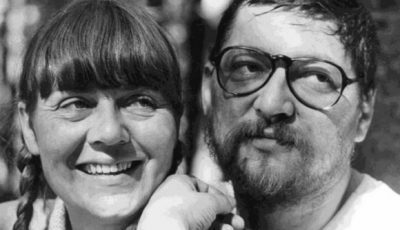 Filmed with a natural, documentary-like aesthetic, the music, all of which is written and performed by Hansard and Irglová, becomes an integral part of the narrative. The stand out moment is the first piece the couple play together: the beginnings of their relationship blossoming in intimate song and performance. Inspired by writer-director Cameron Crowe’s experiences as a music journalist during the 1970s, touring with rock bands such as The Allman Brothers Band, Led Zeppelin, the Eagles, and Lynyrd Skynyrd, Almost Famous is about what happens when the outside world gets to lift the lid on rock music’s inner circles. In this case it’s teenager William Miller who is given the task of covering fictional band Stillwater for Rolling Stone magazine. It’s a journey of self-discovery for the young writer as he becomes immersed in the lives of those he idolises. 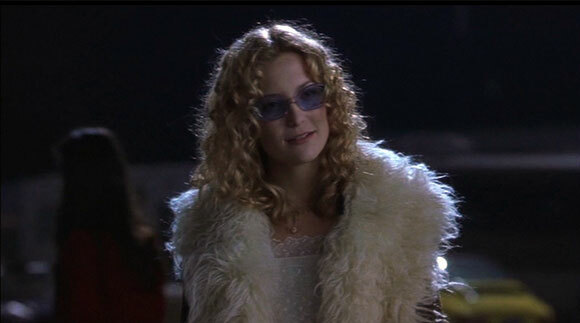 The stand out moment is a subtle scene between groupie Penny Lane (Kate Hudson) and Miller (William Fugit) where she hints at her worldly, if somewhat distorted, wisdom, telling him “it’s all happening” as Nancy Wilson’s gorgeous score plays in the background. You’d be hard pushed to pick a stand out moment from The Blues Brothers, a manic cross country comedy starring legends John Belushi and Dan Aykroyd. The music is one thing but the film is peppered throughout with cameos and star guests; at times it becomes a who’s who of blues rock. Trying to ignore the sadistically entertaining tendencies of the destructive action sequences – the shopping mall chase and the police car pile-up, for instance – John Landis’ film has many wonderful moments where music takes centre stage. If Aretha Franklin shaking her hips while singing “Think” in a café, and Aykroyd and Belushi getting booed off stage at a redneck bar while covering “Gimme Some Lovin” aren’t the best, then Ray Charles bopping to “Shake A Tail Feather” while the whole of Chicago dances in the street must be. 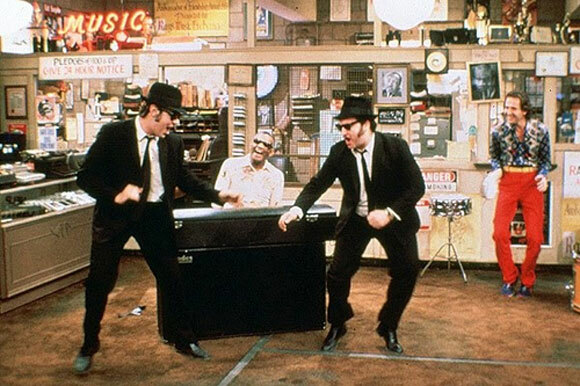 The Blues Brothers is undoubtedly a seminal classic. 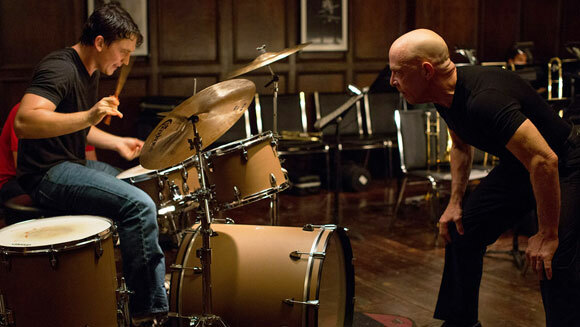 Writer-director Damien Chazelle’s powerful account of a young, ambitious college student and a jazz band conductor is based on Chazelle’s experiences as an idealistic musician in a school band. J.K. Simmons gets most of the plaudits as an overtly demanding perfectionist, whose monstrous methods for his jazz band include belittling his students, public shaming, verbal and physical abuse. It makes for a unique experience as the music – in this case jazz – becomes the foundation to a power-play between student and teacher. 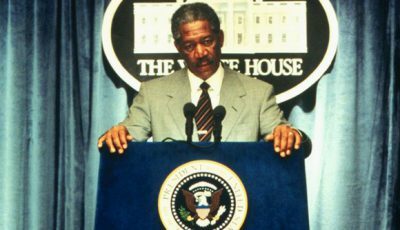 The stand out moment is when the idealistic and the idealised come to climatic blows during the film’s brilliant finale. It’s not just the music that pulls at the heartstrings in Mark Herman’s comedy-drama about the real life tragedy of Britain’s coal mining industry and the impact it had on the lives of those directly and indirectly part of it. The performances of the ensemble cast, notably the brilliant Pete Postlethwaite, bring to heart-breaking life the destruction the industry’s collapse had on people, their families and the community. 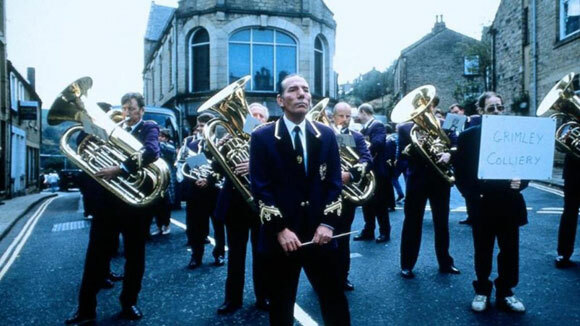 The music, as depicted by the former coal miners’ brass band, is their antidote to this pain. The best moment is when Tara Fitzgerald’s Gloria performs a flugelhorn solo during a group performance of En Aranjuez Con Tu Amor. 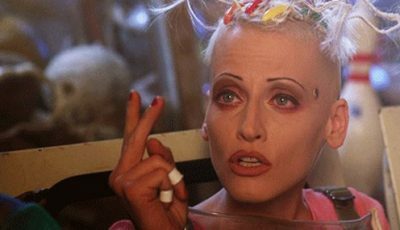 A film that takes itself far less seriously than many of those featured on this top 10 but one that continues to entertain more than 30 years after it was released. Ranked by many comedy polls as one of the funniest movies ever made, the brilliant trio of Christopher Guest, Michael McKean and Harry Shearer largely improvise as rock band Spinal Tap in front of director Rob Reiner’s faux documentary crew. 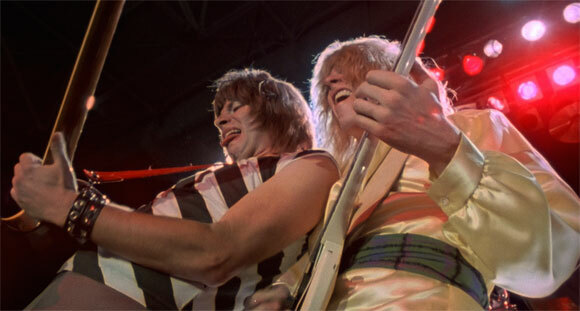 That the music is as satisfying as the laughs is one thing but This Is Spinal Tap set a precedent for mockumentary that has yet to be matched. There are so many great moments but a definite highlight occurs when the group take to the stage to perform Rock n Roll Creation and dodgy production mechanics leave Shearer stranded in a plastic pod playing bass guitar. 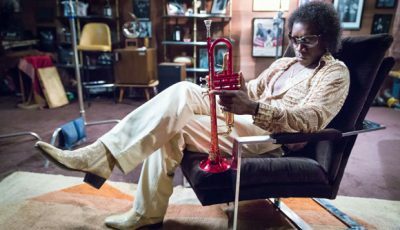 Over to you: what are the best films about musicians? Glad the Pianist got a nod as that was the first one that sprung to my mind from the heading. I’d highly recommend Searching for Sugarman which is a documentary more about a musician than the music itself. I’ll now catch up with Almost Famous which last time I checked was part of the Amazon Prime film collection. Zero issues with Spinal Tap at #1, great choice! Great stuff Dan. I love Spinal Tap. I haven’t seen A Mighty Wind though so to hear it stars the Spinal Tap crew has got me intrigued. Yeah, check out A Mighty Wind, I think you’ll enjoy it. The Pianist was one of the first films I thought of. A terrific film, very powerful and a top performance from Brody but it didn’t fit with my requirements of this list – ie. an emphasis on performance. The Pianist was less about the music, more about the tragedy of the situation. Some great choices! I’d also mention Good Vibrations, Love & Mercy and Straight Outta Compton as some recent/good examples! Great list! Would Velvet Goldmine fit into that category? Velvet Goldmine would fit I suppose. I was leaning towards musicians than singers but I guess I’ve got Ian Curtis and Control in there. 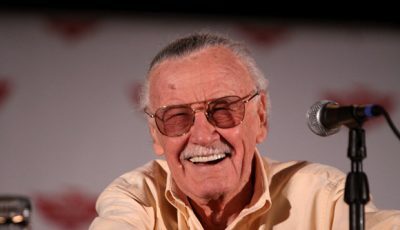 With that one I think of him as a songwriter rather than simply a singer. Good work Dan! School of Rock is a lot of fun. I’m Not There (about Bon Dylan) ia a favorite of mine, though it is divisive. I just reviewed Nashville (1975) and that’s a good one about aspiring country musicians. I’m Not There is a good one. This is a great list – one of my favourite films around music is about pianist David Helfgott its called Shine.